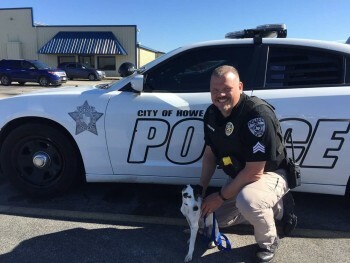 Meet K9 Loki of the Howe, Texas Police Department, where Sgt. Keith Milks and K9 Loki work hard in their community to keep drugs off the streets! Loki is an 8-10 year old Jack Russell/Fox Terrier mix who was picked up as a stray in Cibolo, Texas. The staff of the local animal services department, recognized a great potential in Loki and made sure he was given the training to become certified in narcotics detection. Sgt. Milks and Loki have been a team since early Dec. of 2017. K9DF is pleased to be providing another amazing K9 with an amazing story, the gift of a Buddy Bag. We hope the bag does nothing more than collect dust while in their possession. Here’s to a long, safe, successful and amazing career together you two! Who knew a little terrier could be a K-9? Kudos to the city of Howe, on looking outside the box to find a big dog in a small body who they could rescue and rehabilitate to a useful function! House dust: good for kids? Who knew?